ms Inspire Cruising on the Rhine River. Photo courtesy of Tauck / Scylla A.G. The ms Inspire was launched in 2014. The vessel is 443 feet long and is a member of Tauck’s Inspiration Class ships. It carries up to 130 guests and 39 crew members. 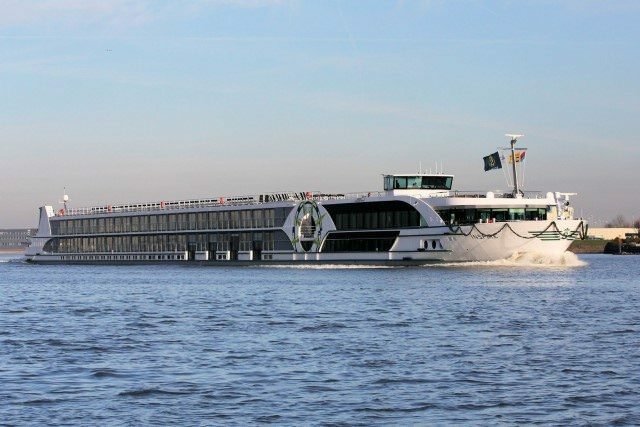 Although, it’s the same size as many other European river boats, it transports fewer passengers. 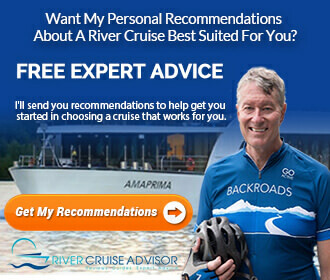 One reason may be because the ship has more suites available than most other river ships in Europe. The ms Inspire has 22 full-size suites. Although, Tauck treats its guests to 5-star experiences, the atmosphere is actually quite relaxed. For instance, dining times are flexible and seating is open. In addition to providing premium-quality accommodations, Tauck also prides itself in providing its guests with one-of-a-kind, culturally-rich private tours. The ms Inspire has a Cruise Director as well as three Assistant Cruise Directors who handle activities onboard and on land. Check our Ralph Grizzle’s live voyage report from sister ship ms Savor in April 2015. Category 3 is a Junior Suite Riverview Stateroom (Loft Suite) and is one of the largest on the ship. The 8 available staterooms are located Midship. This category has one very large picture window (98″ x 114″) rather than two smaller windows. The window opens partially on the top and spans one-and-one-half decks. This category also features a loft sitting area. Stateroom size is 225 square feet. 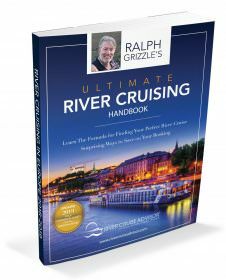 See Ralph Grizzle’s My Loft Stateroom In Video. All cabins aboard the ms Inspire feature luxurious 400-thread count fine linen bedding with hypoallergenic down-filled pillows made of mako cotton. A few additional luxury stateroom features, include Tauck’s exclusive Molton Brown premium-quality toiletries, plus terry-cloth bathrobes and slippers. Bathrooms for all staterooms have elegantly-designed marble baths with showers, and Category 7 Suites feature separate showers and bathtubs. Guests can mingle onboard the ms Inspire in the large Panorama Lounge & Bar on Deck 3, enjoy some friendly competition on the Putting Green on Deck 4 or spend time with friends in the Jacuzzi. There are 3 dining options available to guests. The main Dining Room is located on Deck 2 and provides a more formal dinner setting. There is a also a Casual Dining area located on Deck 3, and Al fresco Dining is available on Deck 4. For guests who like to try to maintain a fitness regimen while traveling, a Fitness Center is located on Deck 1. A few other public areas include a Spa & Massage Room and Hair Salon on Deck 1, Boutique on Deck 3 and a Putting Green and Jacuzzi on Deck 4. All staterooms aboard ms Inspire are fitted with 220 volt and 110 volt outlets in the cabin and bathroom. Read all of our articles on ms Inspire.